The Royal Hawaiian first opened in 1947 and was a Laguna Beach institution for nearly six decades. A second incarnation four years ago brought little local love. 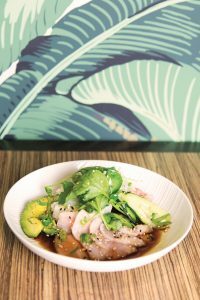 Now third owner Mo Honarkar unveils a Royal Hawaiian that respects the spirit of the Polynesian-themed original, while adding lots of fun tiki-chic touches. Decor includes a Hula Hotel surfboard, orchid gardens behind glass, and colorful light fixtures. Fans of the original will be pleased to know a version of the famed Lapu Lapu rum drink is back, sharing the list with the Zombie and the Hemingway Daiquiri. Pupus include Hamachi Sashimi, above, and an elaborate caramelized five-onion soup with red-wine-braised short ribs, black truffle, and uni toasts. Among the full plates are basil-scented onaga (Hawaiian red snapper) and hoisin-glazed baby-back pork spareribs with pineapple-macadamia fried rice. Finish with pineapple upside-down cake or ginger yuzu crème brûlée.